Plum Granny Farm is a small family farm located in the north central piedmont area of North Carolina. 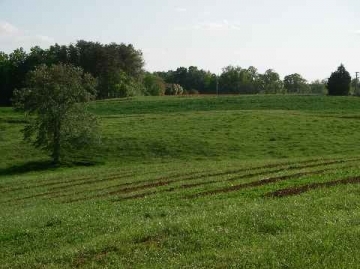 The farm is set on 54 beautiful acres of rolling countryside just south of Hanging Rock State Park in the Capella community.rnrnWe are building on our heritage as a NC Century Farm, as the farm has been in the Ferguson family for over 140 years. We grow raspberries, blackberries, garlic, ginger, specialty veggies, herbs and cut flowers. Most of our products are USDA Certified Organic and all are grown using organic methods.rnrnOur approach to farming is to nurture the soil and the land to return it to its optimal state. Building the soil with cover crops, compost and manure will help us produce better, healthier crops. We believe in sustainable practices and received our organic certification in 2010.rnrnAlthough full-time farming is new to us, we both have deep connections to our farming heritage. Cheryl grew up on this farm and her father, grandfather and great-grandfather all practiced the art of cultivation on this soil. Ray has his farming roots in Kansas where his mother grew up amid some of the most beautiful soil that has ever been seen.rnrnWe hope you enjoy the goodness that we are growing just for you!